Click video to play. If the video doesn't appear, upgrade your Flash Player. You can also download this aRCS Presentation in flv file format. Use any flv players or download VideoLAN VLC Media Player. The Amellar Revenue Collection System or aRCs© is an affordable, highly customizable application specifically designed for local government Treasurers to help them organize and consolidate collection transactions. aRCs© enables local treasurers to prepare fast and accurate financial reports that present the operating performance of the LGUs in terms of both transactional and non-transactional receipts. With aRCs© timely and accurate reports, local Treasurers can immediately provide critical LGU financial information and status to decision makers. aRCs© is primarily designed to handle payment transactions for all fees and taxes being collected by LGUs. And unlike other ordinary point-of-sale or POS systems, aRCs© is a self-learning, highly-secured billing and collection system that understands the variety of transactions being handled by tellers in an LGU, and remembers each specific transaction and stores them for future reference and reporting. aRCs© also provides tools and utilities to allow users to configure the system, generate and print billing notices or SOAs to facilitate collection efforts, and generate transactional reports. 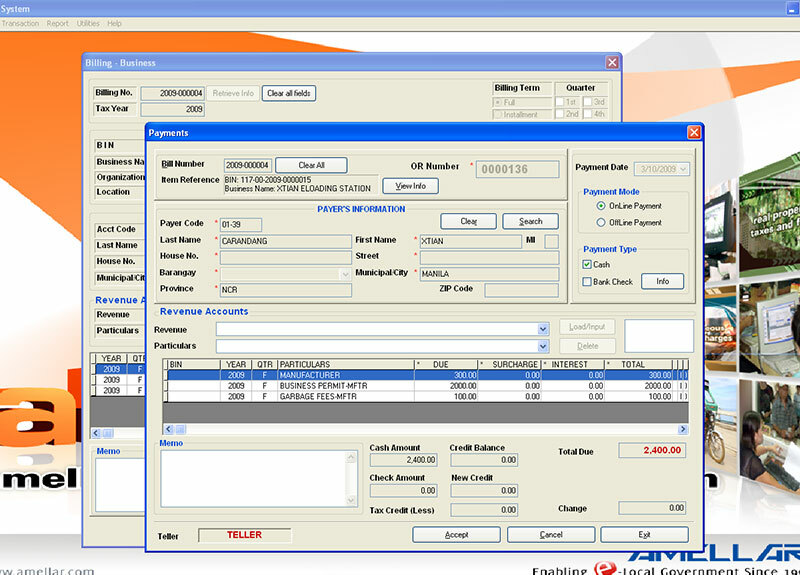 aRCs© also provides easy-to-learn graphical user interface for capturing LGU receipts and from other non-receipt collection documents such as Journal Entry Vouchers (JEV). 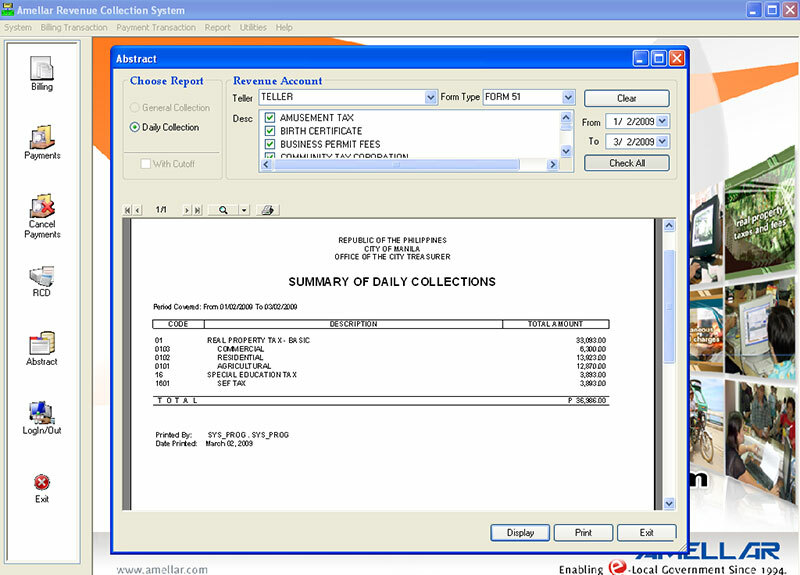 Accept and record all types of payments and collections from taxes, fees and charges from revenue generating operations and economic enterprises, such as real property and business permits and licensing taxes and fees; fees and user charges from inspections, public market stalls, civil registry, engineering permits (occupancy/building permit), police clearances, vehicle registrations, slaughterhouses, cemeteries, legal services, health permits, barangay clearances, community tax certificates; and other miscellaneous fees and charges collected by the LGU. Accept and record all types of non-income receipts, payments and collections from local and external income sources, such as internal revenue allotments (IRA), donations, proceeds from auctions, sale of assets, proceeds from loans, benefits or fund-raising activities. Quarterly report on Collection of Business Taxes, Fees and Charges and Economic Enterprises. 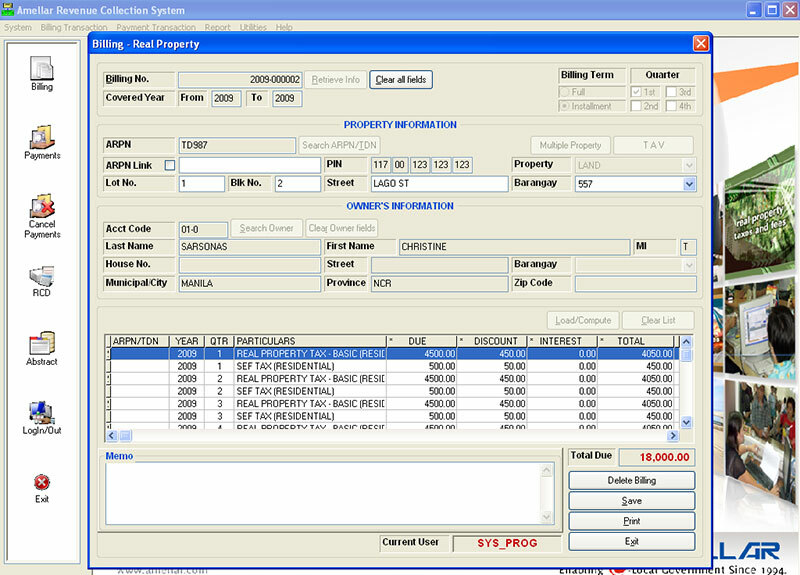 Record and maintain histories on tax payments and non-tax receipts. BLGF Compliant. aRCs© has built-in report generating utilities that automatically create MS Excel files based on the BLGF SRE form templates. 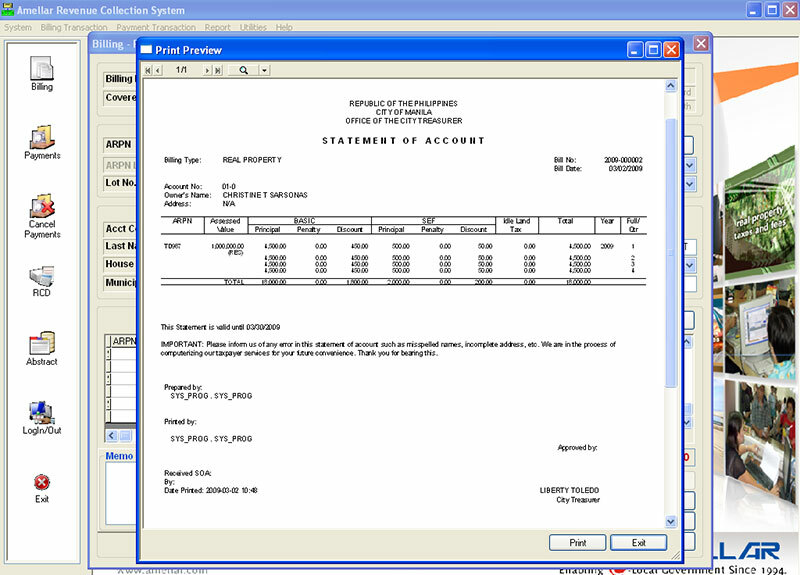 These files can be opened, viewed and edited, if necessary, by end-users using any standard spreadsheet software such as MS Excel and OpenOffice. Fully tested technology. Designed by Amellar and backed with more than 14 years of LGU experience in revenue generating systems. aRCs© utilizes the stable and fully tested tools and modules from the different large revenue applications of Amellar, such as the Amellar RPTA© and Amellar BPLS© applications. These systems have been implemented in more than 40 LGUs throughout the country since 1994. Guaranteed 30-day implementation. With its self-learning capability, aRCs© can be deployed and implemented with basic hardware and software setup. aRCs© is a Plug and Play solution that can easily be deployed and implemented within 30 days from the receipt of an approved Purchase Order (PO). Easy deployment, management and maintenance scheme. aRCs© is not only easy to install, it is also easy to manage and maintain. aRCs© application can be easily set up by a system administrator in workstations with typical configurations. 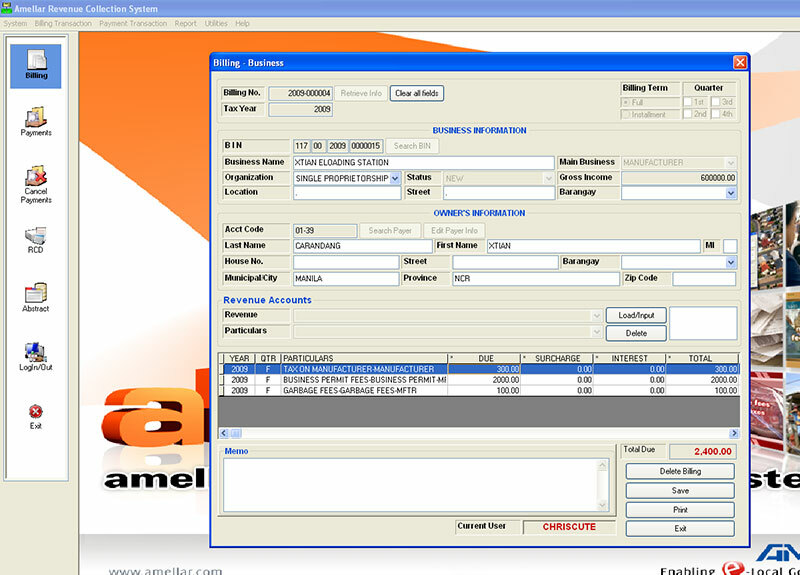 aRCs© is a simple yet full-featured application that comes with configurable tables that are easy to maintain and enable the fast generation of timely and accurate reports. Multiple software architecture options. aRCs© runs in Windows XP or Windows Vista operating systems, and comes with the powerful yet easy-to-install Oracle Database Express Edition. aRCs© can run either on a single workstation without requiring an external database server, or a local area network. For larger LGUs, with more taxpayers and more system users, aRCs© can be configured to run across a local area network in either peer-to-peer or client-server software architecture. Advanced Graphical User Interface. Unlike other DOS-based or command line interface (CLI) applications, aRCs© comes with a fully customized user-friendly graphical user interface (GUI). aRCs© contains graphical icons and visual indicators to fully represent the information and actions available to users. It has been designed using the new Microsoft fluent user interface called Ribbon. Low investment in IT hardware, software and application. aRCs© works in standard workstations that can process and launch typical Windows applications such as MS Office and the like. aRCs© can run in a stand-alone environment, without high-end database servers or local area network setup. Similar to other Amellar revenue systems such as the Amellar RPTA© and BPLS©, the aRCs© is guaranteed to immediately deliver immeasurable benefits to LGUs from the start of its implementation. 100% Compatible with other Amellar Revenue Generation Systems. aRCs© can be combined with other Amellar revenue generation systems such as Amellar aSRe©, MRS©, BPLS© and RPTA© for automatic linkage and extraction of essential information from the databases. aRCs© can generate timely and accurate reports utilizing the BLGF form templates, and create spreadsheet files that are readable with standard Microsoft Excel, OpenOffice.org Calc and other similar spreadsheet applications. While exact hardware and software requirements will vary by LGU, depending on the complexity and volume of transactions, the following minimum configuration allows immediate installation of aRCs© for single user implementation. In addition, the recommended configurations are noted in parentheses for faster and maximum performance.